Today I share with you one of my frankenpolishes. It's a really quick and simple one, but had a great result. The clever and eagle eyed 'silentphrases' actually spotted this one in my Ulta3 stash pic. So I thought I would share it with you. 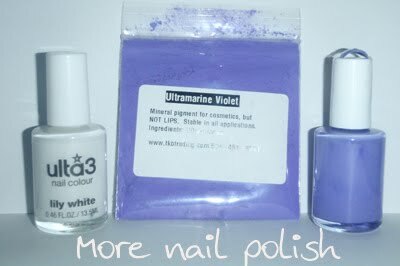 I used a bottle of Ulta3 'lily white' and added about a teaspoon of Ultamarine Violet mica power to it which I bought from TBK Trading. I added a couple of ball bearings, shook the crap out it and taa-daaa. My Violet creme Ulta3 polish is born. This is 2 coats. I'm very happy with it, and I actually don't have another polish this colour in my collection. Wow, that's gorgeous! I tried making a Frankenpolish once by mixing two polishes together. I didn't like either of the polishes to begin with, and I certainly didn't like the end result. I have one bottle like that, I mixed a bit of this and a bit of that, and some glitter and something else, it's just not right, and I don't know if I should have stopped adding to it five things ago, or if I should just keep adding to it to try make it good. I will also share my fails here too - it will make you feel much better. Wow awesome polish! Nice to see close-ups of it! I'd love to have a colour like that in my collection! This is such a gorrrrgeous franken!